It's been six months since my last "Around The Homestead." Time flies! Here are a few updates on projects I've mentioned but haven't followed up on. Pasture improvement and maintenance is ongoing. This fall I replanted two, the buck pasture and back pasture. They are both coming along slowly (too slowly, but what can one do?). Buck pasture, a little farther along. We've been fortunate that November and December have been mild and rainy enough to make for good growing conditions, but the growth is still too young and tender to let the goats on it. I have two small patches of winter wheat. There was a long dry spell after I planted, but at last it came up! the leaves without demolishing the plants. I hope. It's the time of year for that. I've been relocating Jerusalem artichokes and moving volunteer blueberry bushes. Overhauling the garden this winter meant I didn't get much planted for a fall and winter garden. What I did plant has been pretty sparse in coming up. I lament that, but we do enjoy the little bit we get. be the "coal barn" carport. Hopefully that will become my milking room. We've got the old coal barn completely down and the area pretty much cleaned up. The next step will be to trim the dead branches from the old oak tree which could cause damage. That will also be next year's firewood, so that's two benefits with one job. I'm about 95% confident that my Kinder girls have been bred, and about 95% that Surprise hasn't. This is based on whether or not any of them have (or haven't) gone back into heat. I'm not planning to do any other testing, but will keep an eye on them. Helen's due date would be around March 11, Daphne's would be closer to April 2. I've had Surprise with Gruffy repeatedly, but she keeps going back into heat so I'm assuming first generation Kinders are a no go. Thank you to everyone for your kind words about the publication of Book 3 in the series. They are encouraging! If you think it is worthy of your endorsement, please consider writing a review at either Amazon or Smashwords, or better yet, both! Reviews are what help Indie authors get the word out and sell books. Folks want to know what you think! Look for Book 4 of the series to come out next month. When I was a little girl my grandmother often made doughnuts. There was absolutely nothing like them in the world. With no little ones to wake us up early on Christmas morning we had a more leisurely breakfast and I made fresh, hot doughnuts. What a treat! Heat fat or oil to about 375°. While it's heating, combine about a cup and a half of the flour with the remaining ingredients. Mix well. Stir in remaining flour to make a soft dough. Roll out to about 3/8 inch thick and cut with a doughnut cutter. Check the oil temperature by frying a doughnut hole first. It should fry in 2 to 3 minutes. Brown on each side and gently remove. Drain on brown paper. Eat fresh, and coat the remaining doughnuts in powdered sugar. an introduction to salves, creams, ointments, & more. When I launched the series, I asked for suggestions. One request was for information on healing herbs and how to use them. This is my first eBook on that topic. 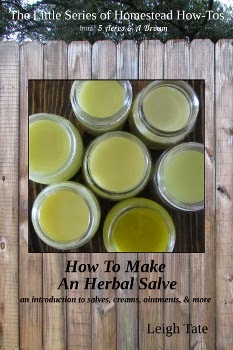 "Herbal salves are easy and fun to make. This little eBook discusses herbs, oils, beeswax, essential oils, why some herbal preparations don't work, and how to make an effective salve. Included are simple, basic recipes for slave, lotion, lip balm and non-petroleum jelly." Like the others, the list price is $1.99 (USD) but, now through Sunday, you can get it for free at Smashwords! Sign up, choose your format, and use this code JF87V (expired). If you prefer, you can have it auto-delivered to your Kindle from Amazon US for $1.99 (where they won't let me offer it for free because I didn't sign up for Kindle Select). You can see all the books in the series (all three so far ;) here, along with a list of where they're available. I'm working on a fourth and hope to have that out soon. After defeating the mitten, she's now ready to chase her tail. Over the years I've written quite a bit about feeding my goats. With our self-sufficiency goals, feeding our animals from the homestead is a primary concern. Progress has been slower than we'd like, and I'm always contemplating how we can do better. Recently, I finished some rather extensive research for Critter Tales, the book I'm currently working on. If it hadn't been for the book I probably wouldn't have dug this deeply, but I'm glad I did because I've come to some conclusions and made some changes in the way I feed my goats. The following is an excerpt from the current draft of the "Goat Tales" section of the book. I hope it will be useful for those concerned about feeding their goats. In the beginning, I assumed we would have to grow grain for our goats. Grains are high in energy but low in crude fiber, as are the beans or peas which are added for protein. Together, grains and legume seeds are referred to as concentrates. This is considered the necessary non-forage portion of the diet. The modern pelleted form usually contains corn and oil or fat for energy, soy or cottonseed meal for protein, plus added fiber, vitamins, and minerals for a complete feed in a bag. With Dan's and my goal of feeding our animals from our land, I assumed I would need to learn how to make my own concentrate mixture. I would need to know what grows well in our area, plus I wanted to find a soy substitute, because soy requires extra processing to make it digestible. To grow a year's supply of these things would be more challenging than the garden. It would require good soil and adequate moisture, but at a scale needing more land, more water, larger equipment, and more storage space. Because of that I wanted to do my homework first. As I researched what to grow for our goats, I learned there are a wide variety of opinions about what to feed them. Some folks are able to maintain healthy, productive goats without grain. Others assume it's a must and can't imagine feeding goats without it. They believe grain is essential to a goat's health and well-being. The reason for feeding grain and legumes to ruminants is to enable them to reach their "genetic potential" for maximum milk production and rate-of-gain, i.e. weight gain for meat. One of the questions I had to ask myself is, do I really need maximum production? If I want to make any significant income from my animals, then my answer will likely be yes. As someone who simply wishes to live on what I can grow and produce for myself, then I need to consider my answer. Is it possible to be satisfied with what my goats can provide without being pushed to their limits? Can I adapt our diet to true seasonal eating? More importantly, does our feeding regimen fit our values of stewardship and self-sufficiency? Is it in their best interests to be pushed to maximum production or will I burn them out? 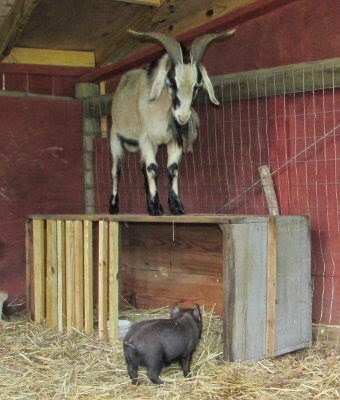 Is it possible for my goats to thrive without a concentrated type goat feed? In goats, symptoms of acidosis are similar to those in cattle: decreased appetite, indigestion, dehydration, depression, weight loss, foot problems, scours, B vitamin deficiencies, decreased resistance to disease, and eventually death. Preventative measures include adequate roughage (especially long stemmed grass hay), whole rather than cracked grain, feeding hay first, and slow changes in diet to give the bacteria in the rumen time to adjust. Acidosis is also the reason goat owners leave out free choice baking soda, so the goats can self-treat mild cases. The problem is that the rumen is not designed to digest grain and seeds. It is designed to digest roughage, which is a generic term for the long stemmed, high fiber plants which make up forage, browse, and hay. According to the classic Feeds and Feeding by F. B. Morrison, the rumen is unique because it contains digestive bacteria which are able to break down plant cell walls, particularly cellulose and pentosans. This is something digestive enzymes cannot do, which is why roughage is low in digestible nutrients for monogastric (single stomach) creatures. Ruminants, on the other hand, are able to assimilate more nutrients from roughages. The longer the roughage stays in their rumen, the more nutrients they can extract. However, the digestive bacteria will also digest the starches and sugars found in grain (and in molasses, which is used as a binder in processed pellets). Dr. Dettloff, writing sixty years later, makes the connection with acidosis. The digestion of starch throws off hydrogen ions which lower pH, initially in the rumen but, eventually, systemically. The body cell membrane's sodium-potassium pump becomes unbalanced so that the immune system suffers and the animal's condition deteriorates. Something that surprised me is that goats don't need high energy feed (grains) to keep warm during cold weather. Among other nutrients, ruminal fermentation produces volatile fatty acids (VFAs). 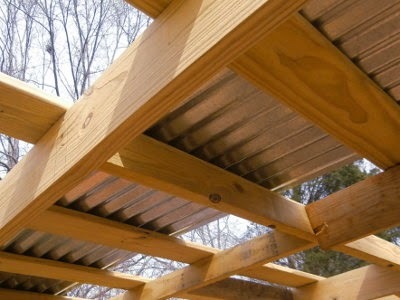 These provide over 70% of the needed energy supply,  enough to enable the animal to stay warm. Robert L. Johnson of the International Dairy Goat Registry concurs, "They need plenty of real roughages–tree bark, dry leaves, poor-quality hay, even straw. If you give a goat a big bowl full of high-protein feeds on a cold winter night, you are actually chilling the goat; still more energy is needed to digest the meal, and goats can get pneumonia." The subject became more complex from there. In addition to crude fiber (CF) some articles now discuss acid detergent fiber (ADF). Basically, higher ADF means lower digestible energy and is used as an indicator of when to add grain to the diet. 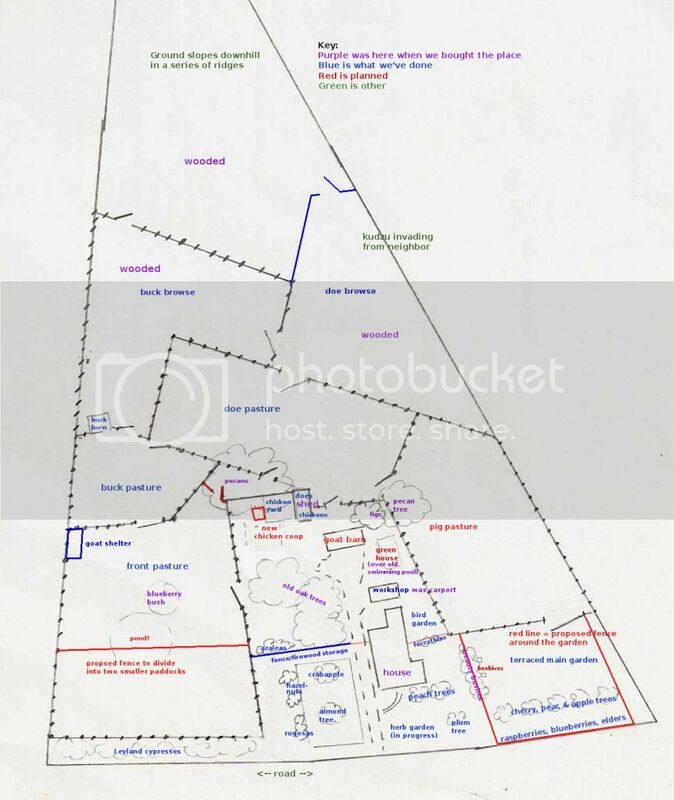 When I could not readily find charts with this information, I began to wonder how complicated I really wanted to get. Isn't the simple life supposed to be, well, simple? My conclusion was that everyone recognizes the inability of ruminants to digest high starch concentrates, but their solutions were finding ways to avoid symptoms rather than eliminate the cause of the problem. They want to dig deeper with scientific research to find the exact numbers needed to obtain a profitable balance between production and health, while adding rumen buffers, neutralizing agents, and inventing rumen modifiers. Trying to find exact, scientifically calculated figures for a roughage/grain/additive ratio may make sense in a dry lot, feedlot, overgrazed, or production situation, but it did not seem the best plan for our goals and our goats. To me that seemed a game of Russian roulette that I don't want to play. Free range goats will choose a large variety of things to eat if available, and are healthier for it. Our job is to steward our land to keep that variety available. That still left the question of protein, another much talked about topic in regards to feeding goats, and another reason why folks feed concentrates. I've written many a blog post reporting my research on the protein content of things we can conceivably grow on our homestead: wheat, oats, amaranth, BOSS, grain sorghum, corn, cowpeas, comfrey, etc. How to make a homegrown feed mix containing the recommended 16% crude protein (CP) was a concern, because the things we can grow don't contain enough CP to get that percentage. That's why soy is commonly used in commercial feeds. It was when I read Pat Coleby's Natural Goat Care that I learned that overfeeding protein can actually cause health problems such as mastitis, acetomenia, milk fever, ketosis, foot problems, and also mineral deprivation, especially copper. In addition, legumes which are used as protein sources: soy, alfalfa, beans, peas, tagasaste, clovers, etc., are goitrogenic, i.e they interfere with the thyroid's uptake of iodine. Fed in excess, they deplete iodine and can cause thyroid problems. I know that when I feed my goats lots of alfalfa, they consume more kelp, which is their source of iodine. Phytoestrogens (plant based estrogens) are another concern and are found in significant amounts of in a number of legumes: alfalfa at certain stages of growth, various clovers, and soy, also some grains such as wheat and oats. These can effect ovarian function, fertility, and milk production . Also they can be a contributing factor in ovarian cysts. These things raised red flags in my mind in regards to whether or not the protein they provide is worth the risk. To put it another way, do goats really need all that protein? Most dairy goat feeds contain a minimum of 16% protein (some higher). 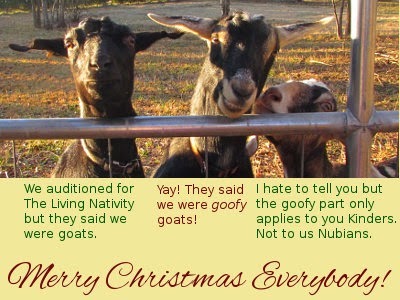 Proponents of natural goat care recommend 12 to 14% [12, 15]. According to the online Merck Veterinary Manual, the very minimum amount of crude protein needed by a non-working goat (i.e. not pregnant, lactating, or in rut) is 7% crude protein. These figures are for crude protein (CP, which is actually nitrogen content). Of that, roughly 70% is digestible . That means 16% CP yields approximately 11% digestible protein, 7% CP would be about 5% digestible. That seemed shockingly low to me after years of trying to figure out how to make my own rations containing 16%. In light of the other information, however, I was beginning to reconsider. An extremely helpful article was one I found by Dr. Robert J. Van Saun DVM, of Penn State University. In "Dairy Goat Nutrition: Feeding for Two (How to properly feed the goat and her rumen)", he states that milk production can be increased by decreasing grain and maintaining a high roughage diet. How is that possible? Because the microbes in the rumen produce the building blocks of protein though bacterial fermentation. "The dairy goat derives a majority of her energy and protein from microbial end products or the microbes themselves. Bacteria contain approximately 60% protein, which is of high quality and digestibility. In other words, the more we make the bugs grow in the rumen system, the less additional more expensive feedstuffs we need to provide the doe." According to another source  ammonia builds up in the rumen when rumen degradable protein exceeds the capacity of the rumen microbes to assimilate it. The ammonia is absorbed into the blood and converted to urea in the liver. This conversion process takes energy that could be used for making milk. This is why too much protein in the diet decreases milk production. It can further create a negative a negative energy balance which can eventually result in reduced fertility. All of this supports a low grain, high roughage diet. Grain can cause problems but roughage keeps the rumen active, healthy, and able to extract those protein building blocks from that it. What does all of this mean to me, in terms of growing grains and legumes for our goats? It means that if I can provide high quality forage, both fresh as pasture and browse, and dry as hay, then I do not need to focus on growing grains and legumes for them. I can put that land to use growing winter greens and root crops to supplement their diet rather than concentrates. If I do feed them grain and legumes, I would rather include it in their hay as whole plants, i.e. before the wheat has been threshed and with the peas still in the pods on the vine. The goats can get the nutritional boost from the wheat and peas, but with the buffering, roughage effect of the stems, pods, chaff, and leaves. They eat it all and the chickens happily clean up any dropped seeds. I'll stop there for now, except to give you the bibliography below with links to my sources. As you can imagine, this has had quite an impact on how I feed my goats. Of grain, I'm down to only a very small amount: 1# daily for each of the Nubian does, about half a cup each daily for the Kinder does (does are fed twice a day so this is divided into two feedings), a tablespoon at the most for the bucks and kids, which are fed once a day. They all get a couple scoops of Chaffhaye, chopped garden vegetables, and a handful of dried herbs, fruits, and veggies. The rest is forage and hay, either what we grow here (including weeds), or the best hay I can find to buy. I've also changed up their minerals and will post about that soon. Since these changes my goats look better than they ever have! Will also add that most of the book isn't this intense or heavy! Mostly I'm focusing on our crazy experiences with our critters, with lots of hopefully useful information thrown in for good measure. Robert L. Johnson, "The Feeding Of Goats" International Dairy Goat Registry, April 29, 1996, sadly the site has changed and the article removed. Gunnar Sundstøl Eriksen, "Effects of phyto- and mycoestrogens indomestic animals"